The common sense view points to racism as being more a feature of the Right than Left. If, like me, you remember the terrifying skinhead marches around the East End’s Brick Lane on a Sunday morning while you were enjoying a kosher hot-salt beef sandwich and the amazing market we had then, you’ll have had this confirmed. But we are going to need to dig a bit deeper. Of course, Brexit is a reminder that at the extremes, Left and Right can exhibit quite similar behaviour. And what we have now in this new racism issue seems more like a reprise: the Establishment media’s bullying of Jeremy Corbyn bounces back after he has weathered it pretty well so far. He’s clearly a socialist, but whether he counts as extreme far-Left is not just common sense but warrants a bit more political debate. He was my MP for 20 years and a good one. I should have thought if the Labour Party deserved a kicking we’d be far more worried about Tom Watson’s financial ties with Max Mosley; but this seems to be largely overlooked, as has Blair’s warmongering. What the British Left is surely guilty of, as it were, is having a partisan approach to the Palestine problem. And this lands you with tricky bedfellows. Because those who decry the state of Israel’s duplicitous approach to settlements and what often looks like a genocidal policy, in blatant contradiction to several United Nation Resolutions, end up sharing the couch with Hezbollah and a whole rafted of Iranian-backed fanatics. This of course is Corbyn’s (and the Left’s) historical dilemma. But the Establishment’s failure to bring this rogue state to task makes such positions very hard to avoid. The implications are, tragically, that the Middle East will never ever be at peace. The specific difficulty confronting the Jewish community is that many of its members, out of an understandable historic fear, get very confused. There is a quite wide tendency to confound historical antisemitism with current opposition to the policies and behaviour – as opposed to the very existence – of the State of Israel. Underlying this is our general reluctance to embrace a psychohistorical view about our world. In the most basic terms, it must be a question for reflection, of how a people who have been so atrociously victimised, especially in the 20th Century, end up with a state in which they have become persecutors, whilst still identifying as victims. How can this psychic paralysis continue? Psycho-spiritually it always amazes me too how the Biblical Land of Milk and Honey gets interpreted as something connected to geography rather than as a psychic attainment of heaven on earth. The Bible, if it has spiritual truth, is not going to be pointing out political boundaries. That’s a philosophical category error. Point. Religions must know the difference, and a bit of Buddhistic impermanence might be in order here. Should citizens of Rome still have a right to govern Berwick-on-Tweed? Come on! Comparisons with the Armenians and Kosovans might be worth making, though the specific stateless state of the Jewish diaspora makes them unique, unless the Kurds approach this currently. Actually, statelessness has its value. And it is what the world needs a bit more of, I would say, if we are going to operate as one world and do something about climate change, for example. In terms of cultural achievements of states, I can think of no better place than Spain in the 10th Century where Jews, Muslims and Christians combined to flourish in a civilisation unique in history: rich with art, architecture, music and science while the rest of Europe struggled in Dark Ages’ barbarism. Something like this could have been achieved again in Palestine, but that boat has sailed. Netanyahu and Trump can’t even hold such a vision, it seems, and the UN is toothless. I can’t help wondering how much the association with Christian fundamentalism – from our own Balfour onwards – which seems to deplore any kind of tolerant and diverse cooperation and is currently dragging America into the mire along with its gun lobby and psychopathic corporotocracy – is to blame. The answer is not the Jermy has to “do something” as the mainstream righteous media insist – I should say the less he does the better. 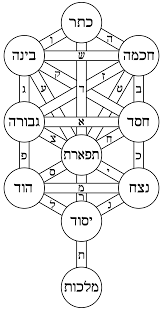 A better answer would be that Jewish spiritual leaders guide their flocks into the deep self-reflection on the Tree of Life that is esoteric Judaism’s great gift to the world and that our media gets the idea too.